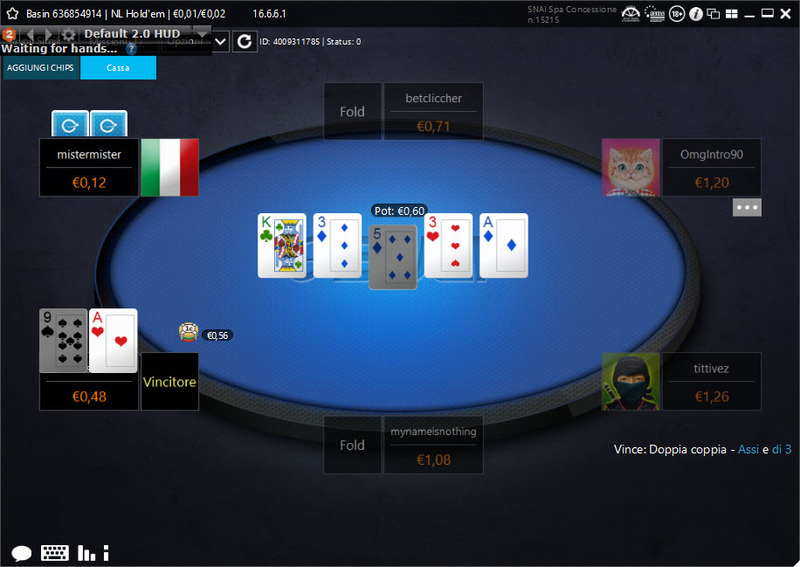 Snai rakeback deal offered by ItalyPokerDeals can be either VIP or flat. In case of VIP rakeback, the system is described below in "Snai VIP System" section. For flat rakeback, please get in touch with our team. 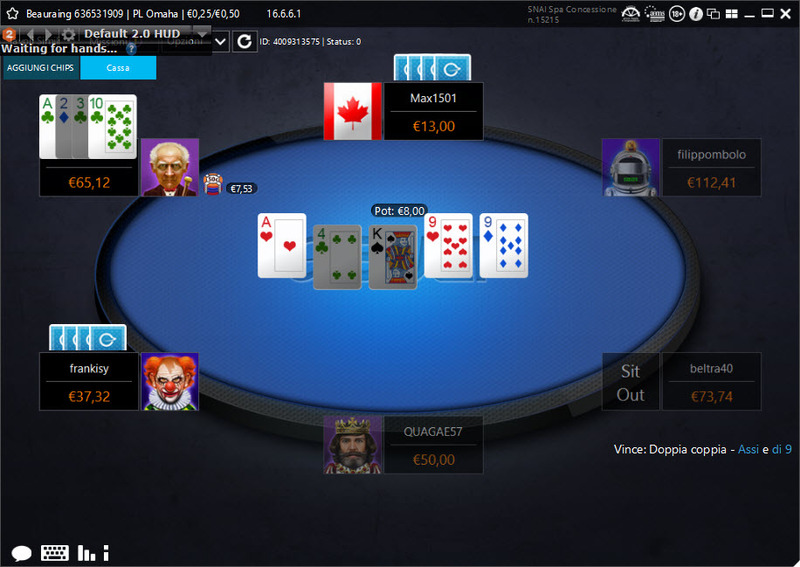 Besides Snai rakeback, the players who want to join this network will benefit from Snai welcome bonus and promotions and for the other advantages offered by ItalyPokerDeals. Snai Poker is offering a 300% up to €1050 First Deposit Bonus, released in €10 installments, which has a 20% rakeback equivalence and a validity of 60 days. Just register a Snai Poker account with ItalyPokerDeals, make your first deposit of at least €350 and you will be eligible to a €1050 Snai Welcome Bonus! This is a Progressive Bonus which will be in pending in your Snai Poker account and in order to redeem it, you have to accumulate Status Points which can be earned by playing real money games at cash tables, tournaments or SNGs. You will receive 20 Status Points for each €1 of rake you generate. Snai First Deposit Bonus will be credited to your account in €10 installments, once you earned 1000 Status Points (you generated €50 rake), therefore, Snai Bonus is equivalent to 20% rakeback. In order to redeem the maximum bonus, you need to earn 105.000 SP which means you have to generate €5250 rake. Snai Bonus is valid for 60 days, so make sure you accumulate the required amount of Status Points within 2 months since your first deposit. If you fail to unlock a part of the bonus, Snai will not offer you a new one. - Status Points (SP) : are the points earned when playing real money cash games, sit & gos or multi table tournaments, at a rate of 20 Status Points for each €1 of rake paid. They are used for establishing VIP levels and for unlocking Progressive Bonuses. - Poker Snai Points (PSP) : are the points awarded to players based on the Status Points amount, at a variable rate, depending on the multiplier associated to each VIP level. They are used for direct registration in tournaments, token conversion or for exchanging bonuses in the VIP shop. The new Snai VIP System (2018 version) is more advantageous for small and medium stakes players, but it is offering a lower rakeback percentage for high rake volumes, compared to the old VIP System (2017 version) whose details can be found here. - Access poker client, go to "My Account" section and then click on "VIP"
Milestones are a mechanism which rewards players who reach Annual VIP levels. Snai Milestones bonuses are offered on top of Snai VIP System rewards. Unlike the VIP levels which are calculated over the last 12 months of activity, the Milestones are calculated starting with the 1st of October of each year. Here is how it works: when you reach 300.000 Status Points, you will get credited a bonus of €500. From this moment on, you will get credited another €500 for each 100.000 Status Points you earn. Players can participate in several Snai promotions and can earn prizes which will make their experience in this room more pleasant and more profitable. This promotions gives you the opportunity of winning some money by playing a series of 4 Freeroll Tournaments with a total prizepool of €12000. To be eligible for this promotion you have to complete some missions which will run across 4 weeks. The missions require you play a specific number of SNGs, Twister, MTTs or cash games raked hands. Twister is a Holdem Turbo Sit&Go tournament, which is disputed between 3 opponents and which gives the opportunity of winning up to 1000 times the buyin. The prize is announced at the beginning of each tournament, before the first hand, like a random jackpot. The average return is 93%. If the prize is below €1000, the prize is entirely won by the winner of the tournament, otherwise the winner will take 80% of the prize while 2nd and 3rd places will grab 10% each. The prizepool of Twister SNGs are established in a random manner. Depositors Freeroll is atournament with €2500 prize pool which is held on a weekly basis. In order to be eligible for this promotions you need to make a deposit to your Snai account, via credit card or bank transfer. Twister Tournaments - A SNG variation with random prize pool. In the tables below you will find the rake structure of Snai Poker cash games, depending on the type of game, on the number of players seated at the table and on the stakes. Rake is not charged in case of hands which end before the flop. Snai.it is the website of Snaitech SpA, which is an Italian company offering gambling services like: sports betting, virtual games, bingo, casino, slots, lottery and poker. 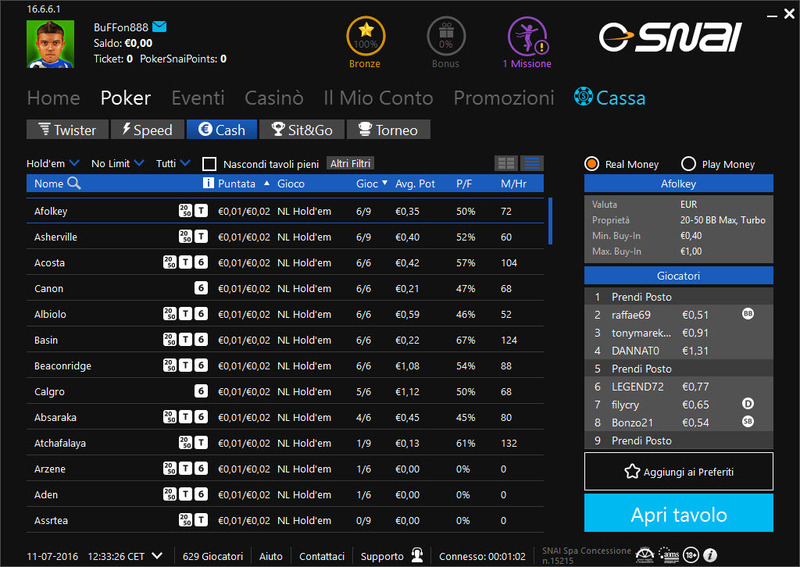 Snai Poker is part of iPoker.IT, the 3rd Italian poker network in terms of traffic, after PokerStars.IT and People's Poker. Snai is sponsoring AC Milan football club and World Series of Poker. If you need to contact Snai, you can do it via telephone at number 800.050.140 or via email using the contact form on their website. Trackers support is available, so you will be able to record statistics using Holdem Manager and Poker Tracker. 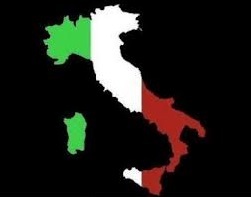 Italian IP VPN is required if you want to access your Snai account from outside of Italy. 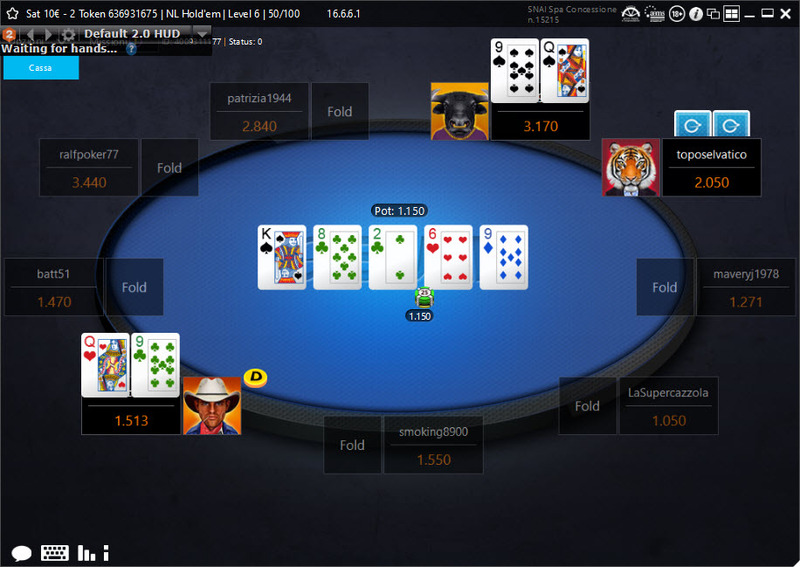 You can download and install Snai poker client without being required to log in the website and all tables are visible in the lobby. But in order to open a table to check the action, you need to log in.